According to Microsoft, it is launching another 12 Days of Deals promotion. Microsoft did this last year, and it resulted in a lot of great deals for people looking to purchase some new tech. This year looks like it is going to be no different. In fact, the Microsoft Store is currently offering the Dell Venus 8 Pro for just $99. This tablet, which usually costs $300, goes on sale today, December 9. It is very clear that Microsoft is doing whatever it can to keep sales up after Black Friday and Cyber Monday. These two days are some of the busiest in the retail industry. That being said, most stores continue to see great sales all the way through New Year’s Eve. This new deal will be offered at all 77 of its Microsoft Stores, along with the next deals that it offers during the 12 Days of Deals. Keep in mind, however, that this deal is only going to be offered to the first 20 people at the registers in each Microsoft Store. Once the first 20 people have purchased their tablets, others can purchase one for $199, which is still a $100 discount. This deal is only good until stock of the Dell Venus 8 Pro runs out. The online Microsoft Store is offering the same deal. However, the $99 tablet will be sold to the first 100 people who check out, starting at 10 a.m. ET. Just like the in-store promotion, after the first 100 people get their tablets, you can still purchase the Dell Venus 8 Pro for $199. 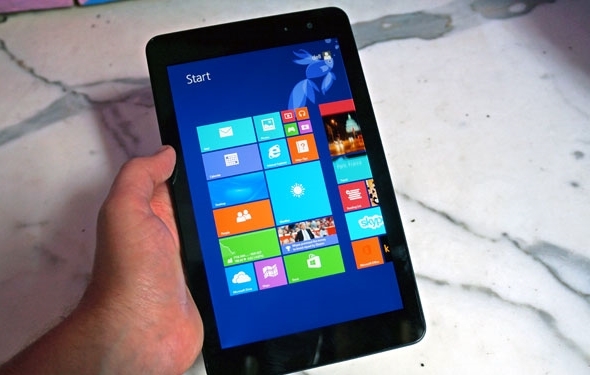 The Dell Venus 8 Pro tablet comes with a nice, large 8-inch touch screen. This screen has a resolution of 1280×800. It also has an SSD drive with 32GB of storage. It is run by the quad-core Intel Atom Z3740D processor, which clocks at around 1.8 GHz and works great for a tablet. The tablet also has 2GB of RAM and is running the full version of Windows 8.1. The Dell Venus 8 Pro comes with a built-in card-reader that supports SDHC, SDXC and MicroSD cards. These can be used to expand the hard drive storage space. The system is also pre-loaded with Microsoft Office Home and Student 2013. The tablet, however, is not packaged with a keyboard dock like comparable Windows 8.1 tablets, most notably the ASUS T100.